The first thing that you need to know is that we well many different variations of this set. 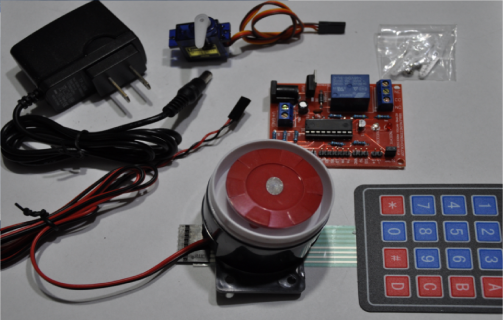 There is an arduino compatible version (Version#1), and a talking version (Version#2). We also sell these in DIY kit form. 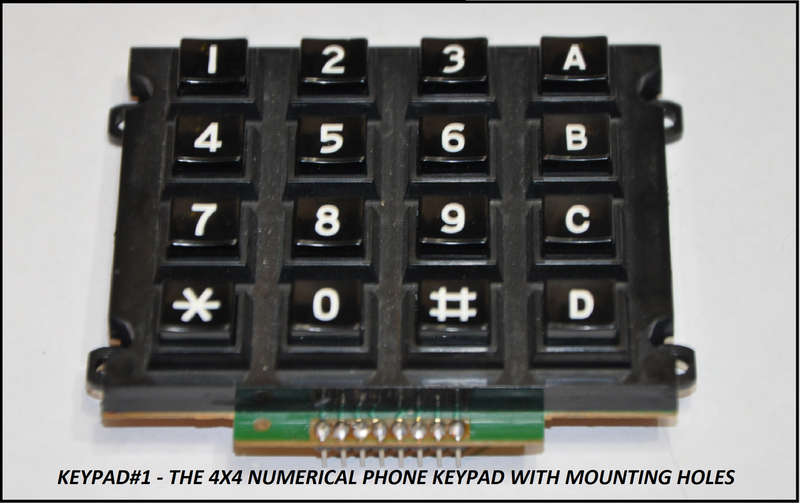 This listing is for a Version#1 4x4 Keypad Matrix Processor set that includes a servo motor, loud siren, wall adapter, a fully assembled/tested version#1 board and one 4x4 matrix keypad of your choice. There are three different keypads to choose from. The keypad options are listed below. After purchase, we will communicate with you as to which keypad you'd like. The above video acts as a video manual that shows you how each unit works, how to program in codes, and how to hook up everything properly. After purchase, I'll send you a comprehensive user manual. There is entirely too much to cover in this section, but I will go over the function briefly. More importantly, you should take a few minutes to watch the above video. Version#1 functionality is covered in the first section of the above video, so you'll be able to see a demonstration almost right off the bat. The video goes over everything. It talks about both the version#1 and version#2 boards. If you are interested in the version#2 board, we sell that in another listing. Just check out our store listings! When you receive your set, follow the plug-in section of both the downloadable manual, and the above video. When you first power up your device, you'll have to program in two 4-digit codes; one for the servo (Unlock), and one for the loud siren or relay (Panic). Once these codes are programmed (Programming is easy!!! ), these codes will be saved into internal EEPROM memory and saved. If the device powers off, it will still remember the codes. You can re-program these codes at any time, as long as you follow the programming instructions. From here, when you enter in the unlock code, the included servo motor will move 90 degrees for five seconds, then revert back. This is to be used as a locking circuit. The UL pin on the board will also go high for this duration. You can connect this pin to an external circuit, such as an arduino if you'd like. Once the servo reverts back to the zero state, you can enter in another combination. If you take too long, the indicator LED will light up for about a second, which means that you need to re-enter the combination. This is called a "Timeout". If you enter in an incorrect combination, the TA (Tamper) output pin will go high, and the red LED indicator will turn on for about a second. Once the LED goes out, the TA pin will go low again (0v). This is yet another arduino compatible output. If you enter in the panic code, the on-board relay will turn on, and, if you have the loud siren connected, it will activate for a minimum of 5 seconds. The indicator LED will turn on for this time, and the PA (Panic) pin will go high (5v). After five seconds elapses, the red LED will turn off, which means that you can turn the siren off by pressing button#1. At this point, the PA pin will go low. See below for more information on the arduino compatible outputs. Which Keypad Should I Choose? When you purchase this listing, I will contact you about which keypad you'd like to choose. 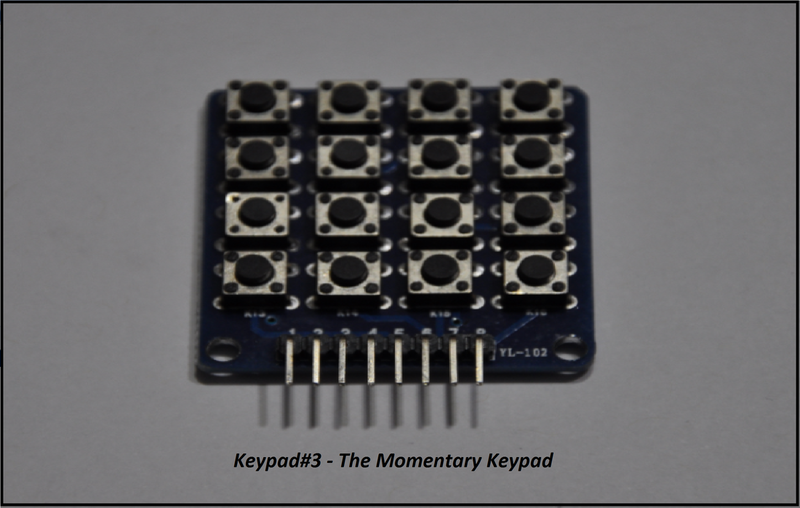 In the pictures, you'll see a numeric keypad (Keypad#1), a membrane keypad (Keypad#2), or the momentary keypad (Keypad#3). 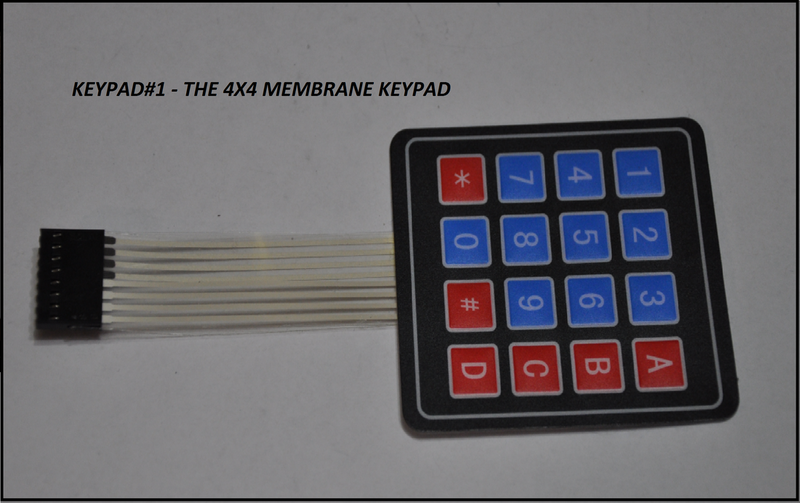 In the pictures, you will see that the membrane keypad is labelled as Keypad#2, but it is actually keypad#2. You can choose from any one of these. 1x Downloadable Manual (After purchase, I'll send this to you. - 2x Programmable codes that are saved into EEPROM memory, so that the codes are saved after power off. A) The Panic code - Activates the loud siren when connected. If you'd rather, you can choose to use the on-board relay to switch an external device on and off as opposed to the siren. B) The Unlock Code - Activates a servo motor, and drives it 90 degrees for fives seconds. After 5 seconds have elapsed, the servo motor reverts back to the zero state. - Easy programming & reprogramming. - 3x Arduino compatible outputs (Unlock/Panic/Tamper). - On-Board relay switch option. LO: When the user enters in a valid lock code, the servo will activate. Also, the LO pin will go from low to high (0v-5v) until the servo returns to its default state. At which point, the logic on this pin will go from high to lower (5v-0v). TA: This is the tamper pin. When you enter in an incorrect combination, the red indicator LED will light up for about 500ms. During this time, the TA output pin will go from 0-5v. When the LED goes out, this output will return to the 0v state. PA: Ah, the panic alarm! If the user enters in the panic code, the relay will turn on, and the siren will blare. That is, if you are using a siren. In any case, as long as the relay is on, the logic on the TA pin will be high. When deactivated, the logic on this pin will return to the 0v state. The PG pin is the programming pin. Please see the operation & programming section below for more information. You should not connect this pin to your Arduino. There is also a regulated 5v line. You can use this to power an external circuit, but it is advised that if you splice to this pin, that your load be less than 100mA. If you are not using a siren or servo motor, and simply want to use this board for the Arduino outputs, you can source up to 700mA from this line. Please do not hesitate to send us an email if you require any additional information! The above video manual shows you everything that you need to know.